What am I gonna do with Leftover Chicken Thighs?? That’s what I asked my best friend Google this morning. Did you know there are ENTIRE WEBSITES dedicated to this topic?? Like THIS one, and THIS one, and THIS – THAT – and – THE OTHER one…. crazypants. I was overwhelmed by the options. After closing and reopening the various sites several times in an attempt to figure out dinner tonight, I turned off the computer and went back to listening to my new Alton Brown Podcast. I was catching up on a couple of episodes and I got to hear his interview with Alex Guarnaschelli – she talks about her dream job, which is THE SAME as INA GARTEN’S! Did you know that Ina Garten (The Barefoot Contessa) was a chef for the PRESIDENT? In fact, according to Alex Guarnaschelli, Ms. Garten got to tell the POTUS that she was quitting in order to go open a grocery store. Turns out that’s Alex Guarnaschelli’s version of heaven too. In Ina Garten’s honor, I did a spin on her Spanakopita for dinner tonight, subbing in Leftover BBQ Chicken Thighs for the Parmesan and Feta. OH OH OH!!! I had a EXCELLENT email a few weeks back from this really great lady from DOROT. They make frozen seasonings that ROCK. My friend Debra introduced them to me and I’ve been meaning to make them a part of my pantry for awhile now. They sent me a fistful of FREE COUPONS (woohoo!!) and tonight I used their frozen Garlic cube instead of dealing with fresh. It’s funny, I’ve been keeping a jar of chopped fresh garlic in the fridge and it’s looking kinda… mucky. I think the frozen stuff is my replacement. I was surprised that the cube o’ garlic seriously melded into the sautéing onions so quickly. Mood lighting. Makes all the difference. 1 cup chopped yellow onion **I used an entire medium sized one. Too lazy to measure. 3 scallions, white and green parts, chopped **I used the DOROT Frozen Garlic Cube instead. 2 (10-ounce) packages frozen chopped spinach, defrosted **I used one. Didn’t want to overwhelm the chicken. 4 extra-large eggs, lightly beaten **I have Large in the fridge right now. They worked. 3 tablespoons freshly grated Parmesan cheese **Since I was making a meat meal, I skipped everything dairy. 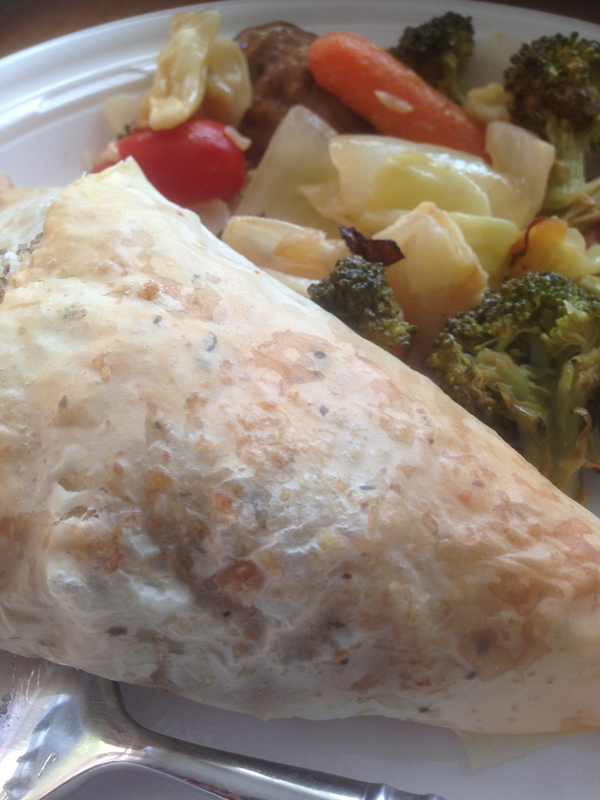 1 teaspoon grated nutmeg **The last time I made regular spanakopita C mentioned the nutmeg added a funny taste. I skipped it this time. 2 teaspoons kosher salt **Since kosher meat is salty anyway, I skipped this too. 1 teaspoon freshly ground black pepper **CRAAAAP. Missed this. 2 cups small-diced feta cheese (12 ounces) **Meat meal tonight. No cheese used. 24 sheets frozen phyllo dough, defrosted **I used 1 roll of thawed FILO dough. 1/4 pound (1 stick) unsalted butter, melted **I used Earth Balance’s Buttery Spread. Oh, and I needed an extra 2 T (that’d be 10T or 1 stick + 2T) in order to brush the tops with melted butter too. Flaked sea salt, such as Maldon, for sprinkling **totally skipped. 1- Preheat the oven to 375 degrees F.
2- Heat the olive oil in a medium saute pan, add the onion, and cook for 5 minutes over medium-low heat. Add the scallions, and cook for another 2 minutes until the scallions are wilted but still green (assuming you’re using, that is). Meanwhile, gently squeeze most of the water out of the spinach and place it in a large bowl. 3- When the onion and scallions/garlic are done, add them to the spinach, and then stir in the chicken. Mix in the eggs, (Parmesan cheese), 3 tablespoons bread crumbs, the nutmeg, salt, and pepper. Gently fold in the (feta and) pine nuts. Pile 4 layers total on top of each other this way, brushing each with butter and sprinkling with bread crumbs. Cut the sheets of phyllo in half lengthwise. **I used a pizza cutter. Woo Hoo. 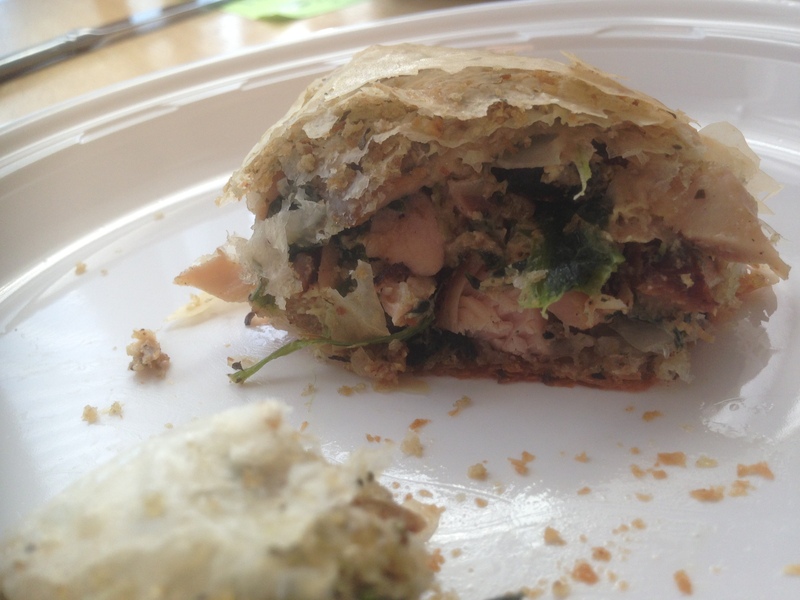 Place 1/3 cup spinach filling on the shorter end and roll the phyllo up diagonally as if folding a flag. 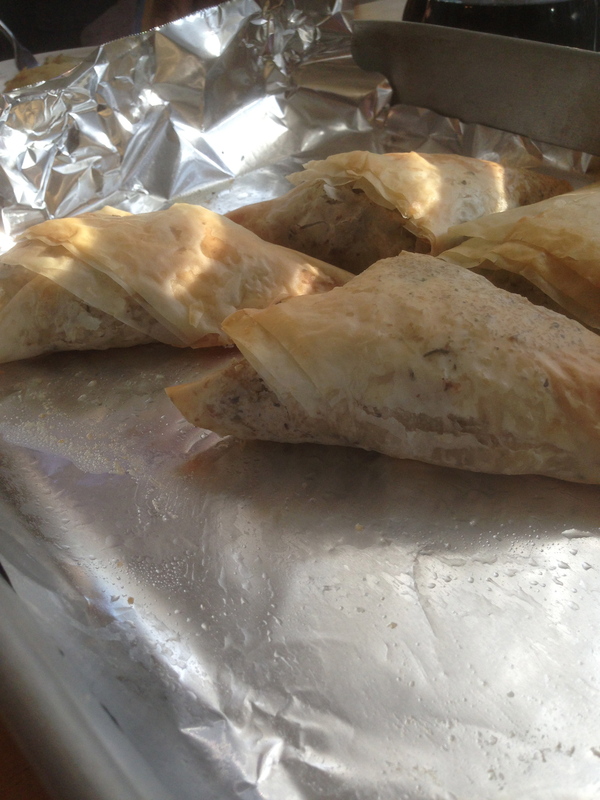 Then fold the triangle of phyllo over straight and then diagonally again. Continue folding first diagonally and then straight until you reach the end of the sheet. The filling should be totally enclosed. 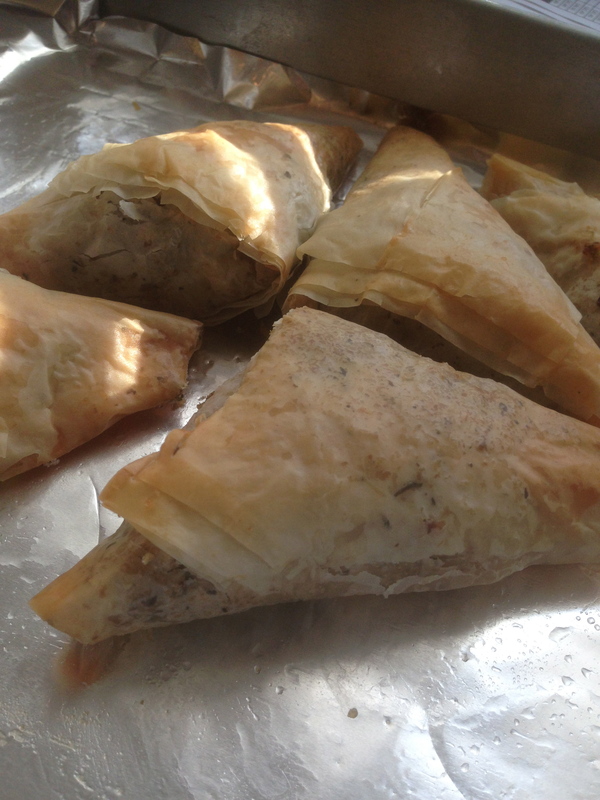 Continue assembling phyllo layers and folding the filling until all of the filling is used. 5- Place on a sheet pan, seam sides down. Brush with melted butter/Margarine, (sprinkle with flaked salt,) and bake for 30 to 35 minutes, until the phyllo is browned and crisp. Serve hot. I ate mine with a side of roasted veg. END RESULT: These were good, but a little dry. I whipped up a quick sauce of Tofutti Non-Dairy Sour Cream, Hellman’s Mayo and some Sweet Chili Sauce. While I managed to ladle it over just about everything on my plate, C chose to abstain.